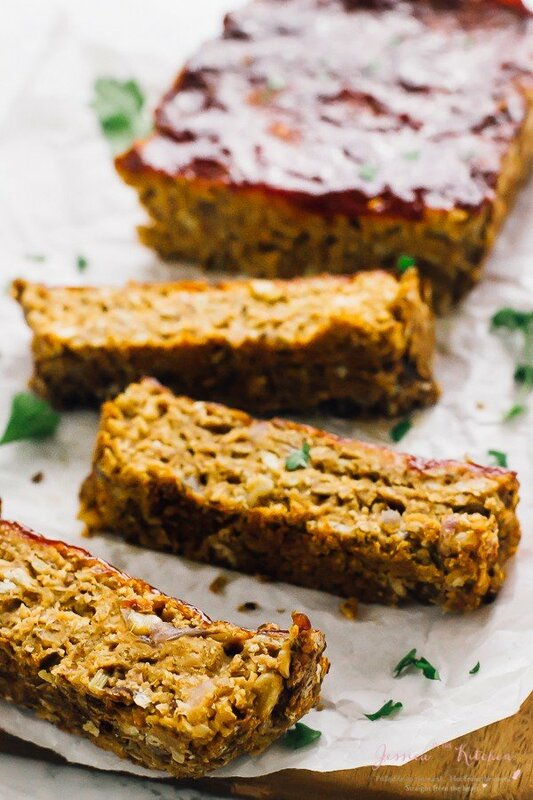 This Vegan Meatloaf is the perfect quick and easy dinner recipe! It’s made with chickpeas and lentils, tastes delicious, is gluten free and healthy! Friends – tis’ the month for Thanksgiving recipes!! I’m bringing so many vegan Thanksgiving recipes your way this month so prepare yourself for all the deliciousness you’re about to experience. I’ve already made a vegan pumpkin pie and all season pie crust, so I went right to the savoury recipes. 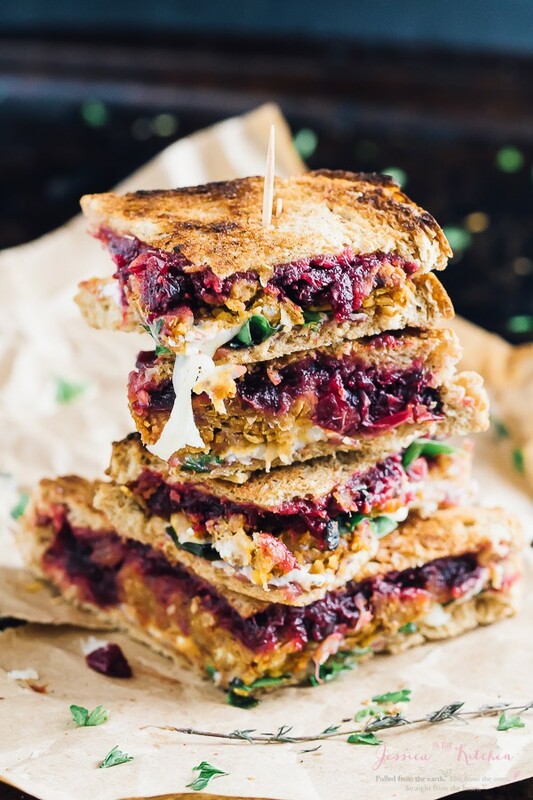 I’m making a mental Thanksgiving dinner list in my head and it cannot be complete without this divine vegan meatloaf. Fact: I up with a vegan meatloaf recipe is an interesting process. For me, the perfect combo would be a moist, yet firm and absolutely delicious meatloaf, so I got right to work. Fortunately, after just a few tries and eating LOTS of lentils, I got it down to the perfect ratio of moist vs firm. I knew that I wanted this to also be healthy and filling if it was to be a true main dish recipe. 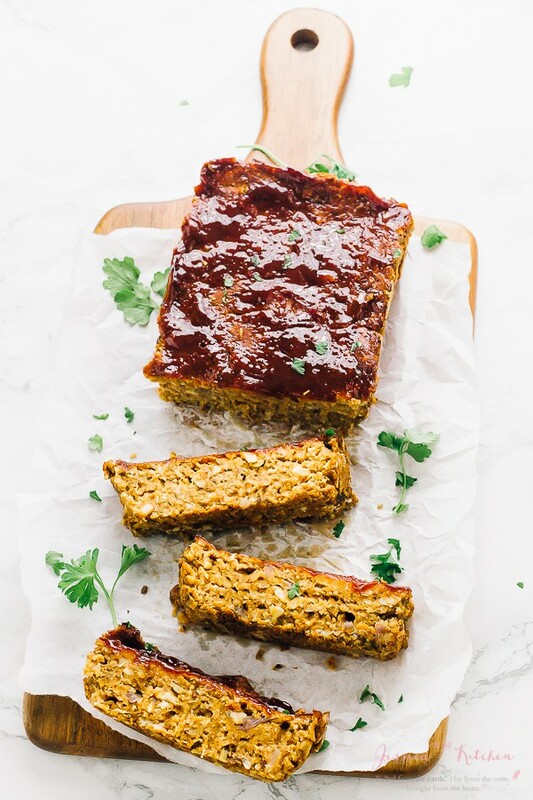 This vegan meatloaf is made with chickpeas and lentils and that not only contributes lots of nutrition value (see below for that info) but it guaranteed that you’d be full. One slice is literally enough for me to be full eating this in a meal, so keep that in mind that this loaf could also feed quite a few people. I said I had proof that everyone would enjoy this. My 14 year old brother, who I guess I can’t really call my “baby” brother anymore, tried this. Well, as my mom let me know, he kind of devoured it immediately. GREAT SIGNS friends because children do NOT lie about food! I of course tested it out on anyone I could get near it with, all of who approved it 100%. Win, win friends. 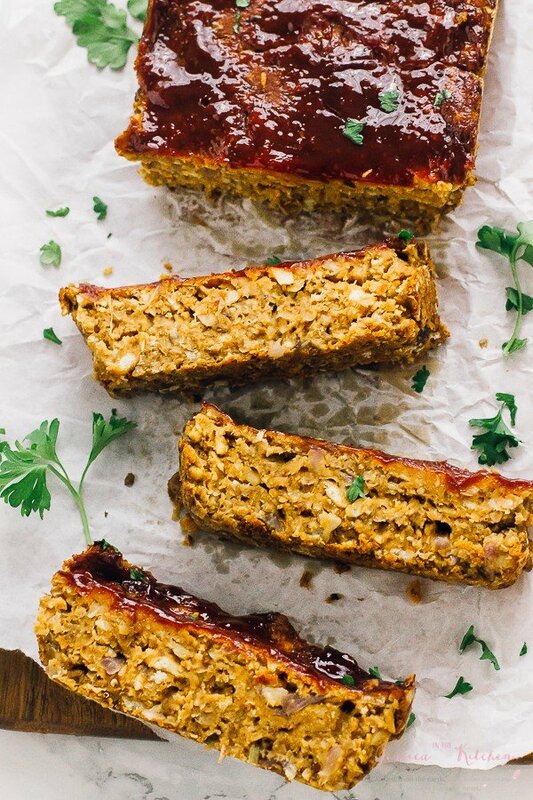 If you try this vegan meatloaf, you will not be disappointed. Yeah, I say that with almost everything right? Well I had this for breakfast, lunch and dinner for like, 8 meals straight. I can’t believe I just typed that. It’s super versatile so you can make it in a sandwich, mince it up and use it on a mini veggie pizza, or in like a breakfast hash recipe. I guess that makes me a *wait for it* (vegan) meat-head! Please pretend to laugh. P.S. the glaze is absolutely divine. I confess to umm, spooning it off and eating it separately because it was that delicious. If you’d prefer a bbq glaze you can just sub the tomato paste for organic bbq sauce. Great news – this meatloaf has tons of great nutritional benefits! Lentils – The lentils make this recipe filling, fiber-rich, and are loaded with Vitamin K and lean protein. Chickpeas – Chickpeas easily provide a lot of fiber and protein – one tablespoon has over 2g of protein!! Fiber – The lentils, chickpeas and all the vegetables provide lots of fiber for you which helps to aid with digestion and keeping you full. Flaxseeds – Even more great fiber! This also helps to keep your super full. This recipe is pretty healthy and is loaded with lots of heart healthy and cholesterol friendly ingredients like coconut oil and apple cider vinegar. Q: My vegan meatloaf isn’t holding firm. What should I do? A: This really shouldn’t happen since I test the recipe to avoid this. To prevent this happening, PLEASE do not over pulse your ingredients. I did this the first time and it turned to mush and wouldn’t firm up. Leaving chunks somehow helps it to come together. Also, ensure that your toothpick comes out pretty much clean to confirm everything is cooking together. Ensure you’re using the right size pan since a too wide meatloaf will not hold up properly. Let it sit for at least 10 minutes to cool at room temperature. If you’ve done all of this and it’s still giving problems, then last resort, if you sit your meatloaf in the fridge for like an hour, it will firm up completely. Then slice it up. I cut my slices about 1-inch thick. Mix your ingredients for your tomato glaze and set aside. Preheat your oven to 375 degrees. Prepare a loaf with by lining with parchment paper so that it's hanging over the sides. This helps to remove the loaf with ease. In a skillet over medium high heat, heat the coconut oil. Add the garlic, red onion and the celery. Sauté until onions are translucent and celery has softened, about 5 minutes. In a large bowl, add all of the ingredients, and mix together slightly with a wooden spoon. I find that this helps to distribute the liquid ingredients equally one the beans and breadcrumbs. In a food processor, add all of your ingredients. I have a 10-cup food processor, so if yours is smaller, you may want to put it in in increments. Pulse a few times until everything begins to come together. Do NOT over pulse - it will turn to mush and not firm up in the oven. You want to see chunks of celery, lentils and other ingredients. I like to pulse about 10 times. Pour/scoop the ingredients into your parchment paper lined loaf pan. Smooth down the top with the spatula and then pour the glaze over, smoothing it down. Bake for 45 minutes to 60 minutes. My loaf was done at around 55 minutes. It's ready if a toothpick comes out mostly clean. Remove from oven and allow to cool for 10 minutes. Remove from loaf pan and slice up and serve. Enjoy! If you try this Vegan Meatloaf please let me know in the comment section below, or tag me on instagram with the hashtag #jessicainthekitchen! For more exclusive recipes follow me on Instagram AND on Snapchat: jessinkitchen. Make sure you pick up Vegan Worcestershire sauce! You can store this loaf in an airtight tupperware container in the fridge. You could also just saran wrap or foil wrap the top of the loaf pan if you want to preserve the shape of the loaf. This will last at least a week in your fridge. This loaf with firm up a whole lot in your fridge. Wrap the loaf in foil, then put it in a freezer-friendly zipped bag. This loaf can freeze for at least 2-3 months. Thaw overnight in your fridge, and reheat in your microwave. This lentil bread looks very delicious and packed full of goodness! This looks delicious and would make an amazing Meatless Monday meal! I love it! Just wondering if i could use regular eggs and Worcestershire sauce?? Or if the recipe wont hold the same. Thanks! Definitely! That would work just as well. Hope that helps! I have made many of your recipes, all are super delicious… I made this vegan meatloaf and it is addicting. It came out great. The loaf held up especially after a day in the fridge. This recipe is versatile, I added chopped carrots, and as noted in another of your recipes, left overs could be used as any “meat substitute”. Thank you so much for sharing your recipes with the world. Thank you SO much for your feedback and kind words!! So glad you enjoyed it, and I love your additions. You’re so welcome!! Is the liquid smoke mandatory or can I substitute something else? It adds a great depth of flavour, but if you can’t find it you can add low soy sauce or vegan Worcestershire sauce! Thank you I will try and find it. Could I substitute oats for the bread crumbs? I haven’t but once it’s ground down a bit it should work! Let me know your thoughts! I just made this and it’s great. I followed it to the letter except that I skipped the liquid smoke and used low sodium soy sauce instead. Also, I skipped the glaze. I made my own bread crumbs – via toast in the food processor. I actually made double the recipe. Good dinner awaits for the next week. Thanks for offering this recipe! Yay I’m so happy to hear that!! Thanks so much for sharing with me and so glad you enjoyed!! What size pan would you use? I’ve used a 5 x 9 and a 8.5 x 4.4 and they both worked great with this! I hope that helps and that you enjoy!! I cannot have 2 kinda of legumes at once due to digestive issues , can I use all chick peas, and maybe cook 1/2 of them til Soft, as lentils can be? Hi Jessica, I don’t have breadcrumbs on hand, can I use panko instead? I made this recipe today! It was super easy to prepare and it came out so great! It was soft and moist and flavorful. The next time I make it, I will be making two of them so I can have some left over to freeze. I’ve made lentil loaves in the past, but this one by far exceeded my expectations! I’m looking forward to preparing another one of your recipes! I am SO happy to hear you enjoyed it!! Thanks so much for sharing your comment on the blog post!! I hope you continue to enjoy my recipes!! I was visiting my Mexican grandparents when I found this recipe. They have a high standard when it comes to taste and often find a meal isn’t complete without meat. That said, I still experimented with the recipe. I used their kitchen, which meant I had to use their blender that’s almost exclusively use for salsa. Still, I maganged to pulse the mixture to perfection. I made vegan mash and some asparagus to compliment the loaf but it really stood out on its own. My grandparents not only ate it for lunch, but also dinner! My grandparents loved how flavorful it was and filling it was. Oh yay I am so happy to hear this! Thanks so much for sharing your story with me and how much your grandparents enjoyed this!! Thank you so much for sharing this recipe! I made it for my family and it turned out amazing, everybody loved it! A recipe I will make over and over again! Aww you’re so welcome Malika and I am just so happy to hear this!! Thanks for sharing your feedback!! This recipe is great! 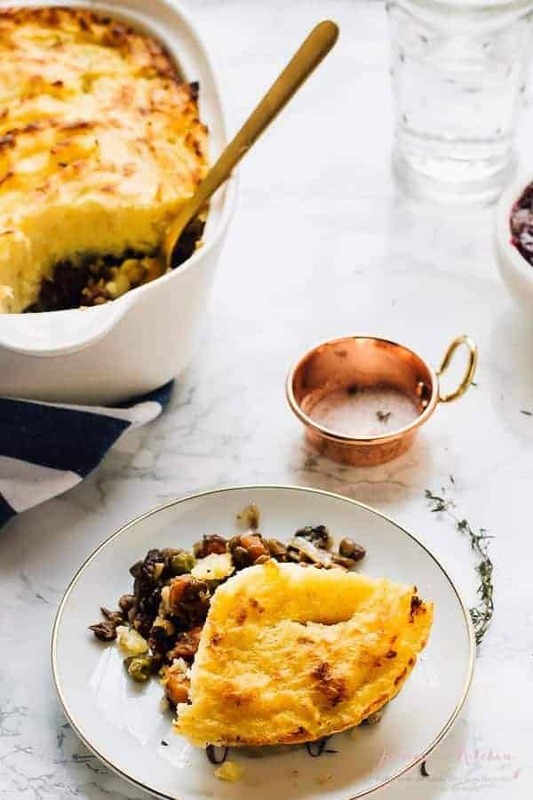 We had our first vegan thanksgiving this year (we are in Canada) and it did not disappoint!Wondering if this recipe would work if baked in a muffin pan? Any recommendations for bake time in a muffin pan? Thanks! I’m so happy to hear this and thanks for sharing your feedback!! It should be able to! It would probably bake for about 15-22 minutes instead and I would still line the muffin pan. I hope that helps! You can call him your kid brother at least for a while and maybe always. Your call. Thanks for sharing! I am Greek Orthodox so our fasting before Christmas starts in mid-November and I have struggled with Lenten dishes. This would be a perfect dish to make in place of the bird or piggy! Hi, just wondering if I can use liquid aminos instead of liquid smoke ? I haven’t tried that in place before, but I think you should be able to due to similar flavour profiles! The liquid smoke really adds an amazing flavour though, so if you can I would highly recommend it! I hope that helps!! Hi, This looks delicious and I am looking forward to trying it. I don’t have a food processor, however, is a blender going to be able to handle this mixture? I have 2 grown children who are vegan so I am grateful for your yummy recipes. I’m a flexible vegan lol, and I so wanted to love this meat loaf but I didn’t. I’m not sure what happened. Everyone said it was okay to good but I could not get behind it. Now I was rushed and maybe I didn’t do it right or added an ingredient that was not meant for it but I love all your other recipes so I was surprised at this one. The Veggie Pot Pies which I also made were winners!!! I’m still a big fan. Please let me try it again, Jessica, under calmer circumstances other than Thanksgiving. Happy Holidays! I just made this recipe, and it was very much appreciated by my carnivorous husband (and myself). I cooked my own lentils in the instant pot (super easy— 2 parts broth to one part lentils, 8 minutes on high pressure), and used a hand masher to mash everything. It came out beautifully. Thanks Jessica! What do you think about adding raisins or raisins, something chewy and sweet? Or maybe some walnuts? 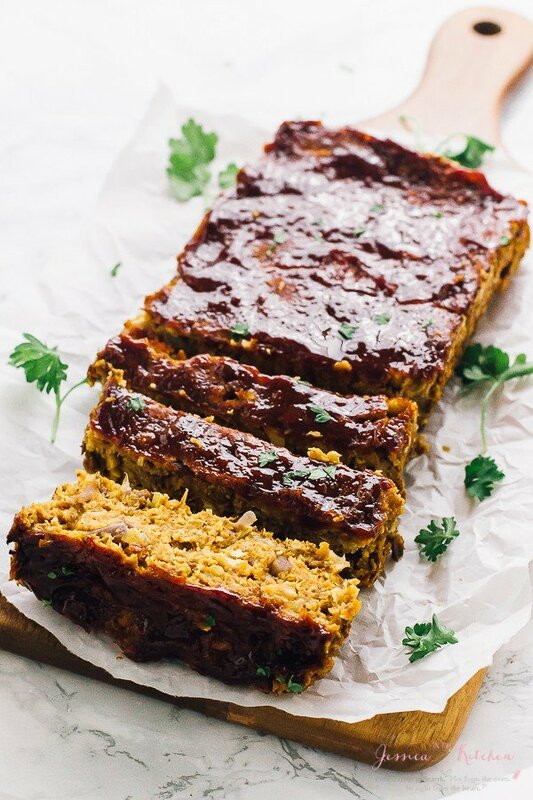 looks so yummy – I’ve tried other vegan meatloafs I wasn’t crazy about in the past, so excited to try yours! Oh wow I’ve never tried that! I wouldn’t think about adding something sweet but if that’s what you’d like, then it would work! I hope that helps and enjoy Kristen!! wow I’ve missed your recipes. gosh i wish you had a book instead of erecipes. you make the best and so doable recipes. they aren’t boring and expensive to do. Hi, just wondered what type of lentils did you use for this? Hi Lottie, I used brown lentils for this! Could you substitute chickpeas with another type of bean? I’m not sure, cause I haven’t tried it and wouldn’t want to lead you astray! Is the recipe written correctly that it’s 2 tablespoons of liquid smoke? I have never seen that much used before as it’s such a strong flavoring. I am making it for the first time to take to Thanksgiving so I’m nervous about using so much! Please let me know asap. Thank you!! Yes it’s correct! Don’t be nervous! 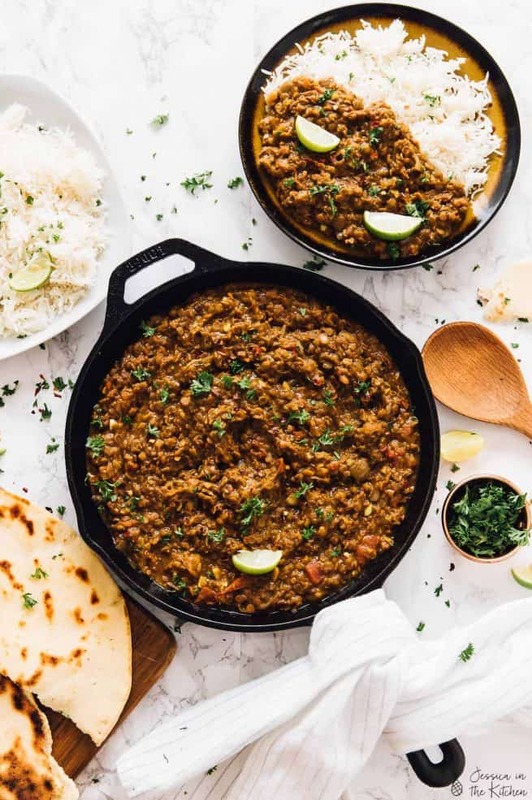 It’s needed since lentils have such a strong earthy taste to transform them. You’re so welcome and I hope you enjoy!! Hi Kelly we’re glad that you enjoyed it!